Dr Qazi Kholiquzzaman Ahmad, Chairman of PKSF and concurrently the Chairman of Dhaka School of Economics (DScE) has been bestowed with a new laurel. 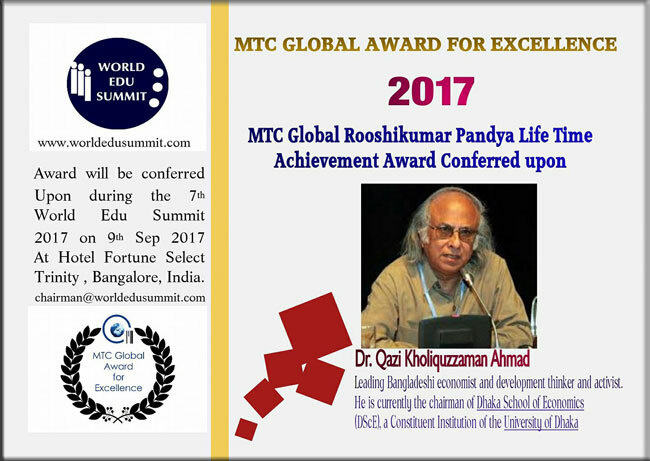 Management Teachers Consortium-Global, an India-based voluntary non-profit group and known across the world as a top level global think tank in higher education has conferred upon Dr Qazi Kholiquzzaman Ahmad MTC Global Rooshikumar Panday Life Time Achievement Award. MTC Global has selected Dr Ahmad as a leading economist of Bangladesh, a renowned development thinker and a dedicated activist. To recognize the excellence of persons in different areas of education, MTC instituted few awards from 2010. These awards are rated very high by the academia at the global level. Many top leaders in the academia and the corporate sector have earlier received this MTC Global award.